The Basque city of San Sebastián boasts one of the highest densities of Michelin stars in the world. 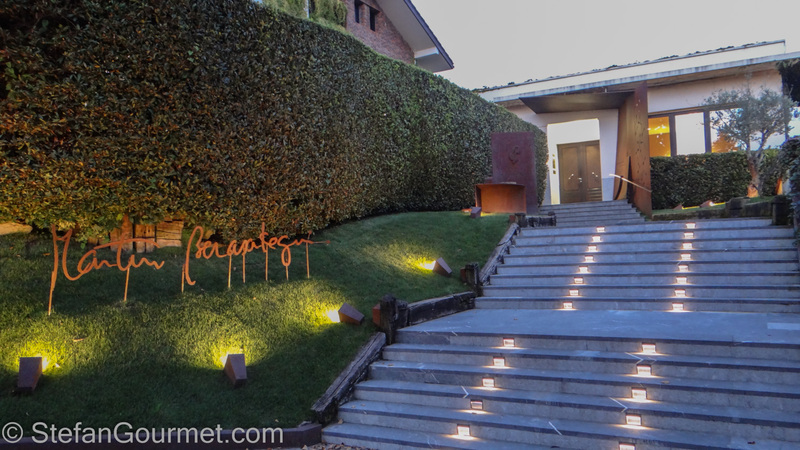 We went there for a few days to try the local cuisine, and one of the highlights of our trip was our dinner at Martín Berasategui’s restaurant in Lasarte-Oria, a suburb of San Sebastián. That suburb is not that nice, but that is something you forget about as soon as you set eyes upon the restaurant and the view on a lush hilly landscape from there. We were given the choice to sit outside on the veranda, which was very nice. When it got a bit chilly, a terrace heater was supplied. 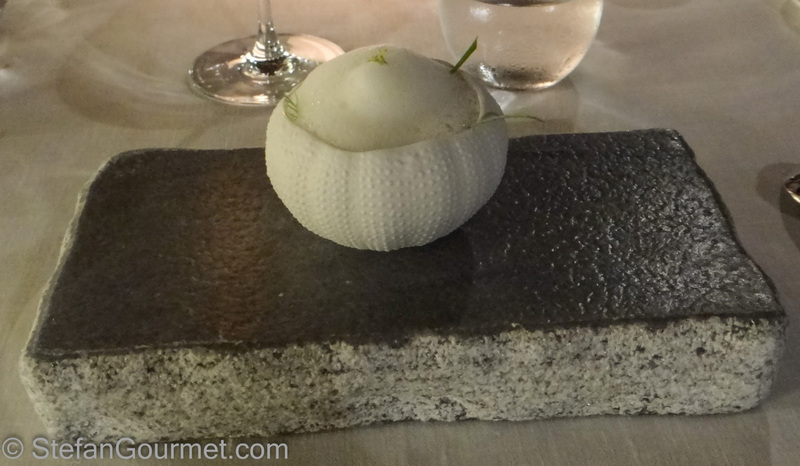 Berasategui has three Michelin stars and is ranked #35 on the world’s 50 best restaurants. 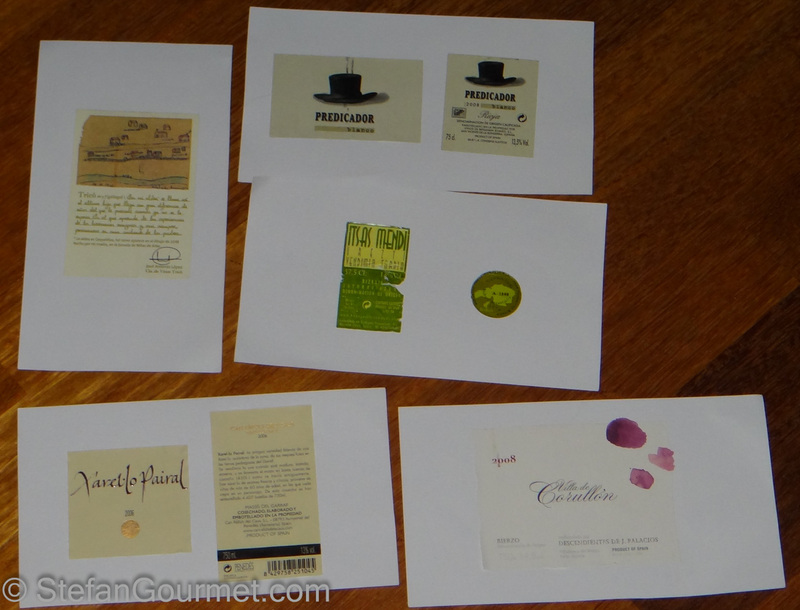 We opted for ‘the great tasting menu’, 15 small dishes for 195 euros (excluding 10% tax). Unfortunately there is no wine pairing, although that may be better than a bad wine pairing as offered at some restaurants. The sommelier helped us select bottles from the extensive wine list. Since there were four of us, we still got to taste a number of wines. The sourdough bread was one of the best I’ve ever had. What I really liked about it was the crust: very crispy and crunchy without being too thick as is often the case. 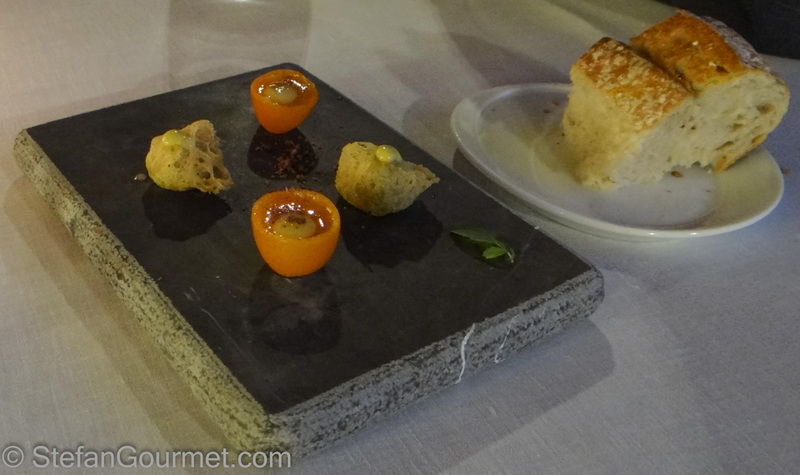 The first two dishes were served together: sea crunch tempura with txakoli wine mayonnaise and citrus gel (2014) and kumquat, potato eau-de-vie, olive and anchovy (2014). 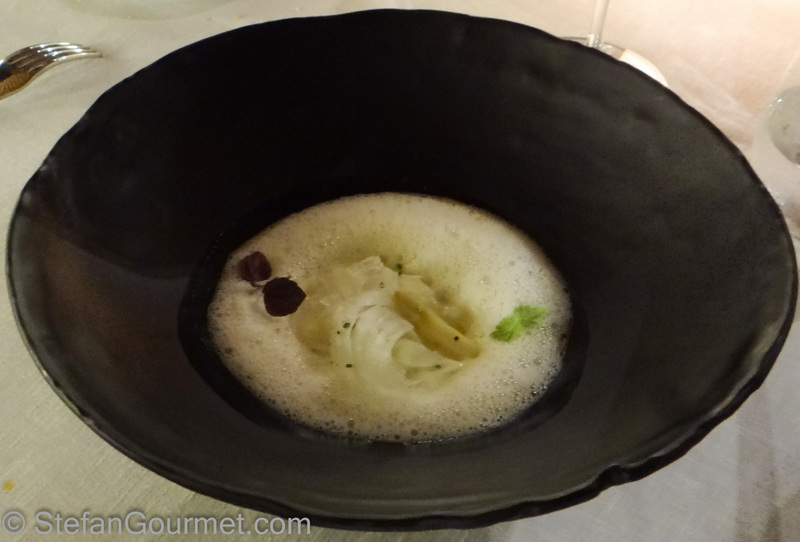 Both had very nice and complex flavors, a good start of the menu (9/10). 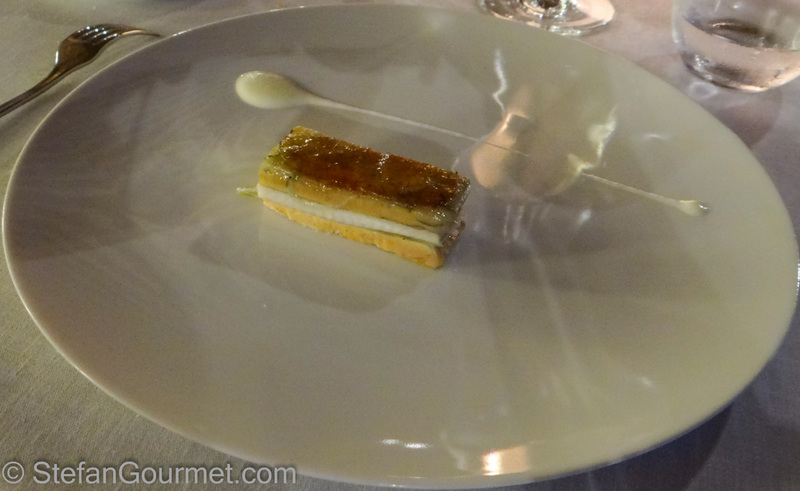 Next up one of the chef’s signature dishes: mille-feuille of smoked eel, foie gras, spring onions and green apple (1995). This was outstanding, we easily could have finished a whole plate of this. 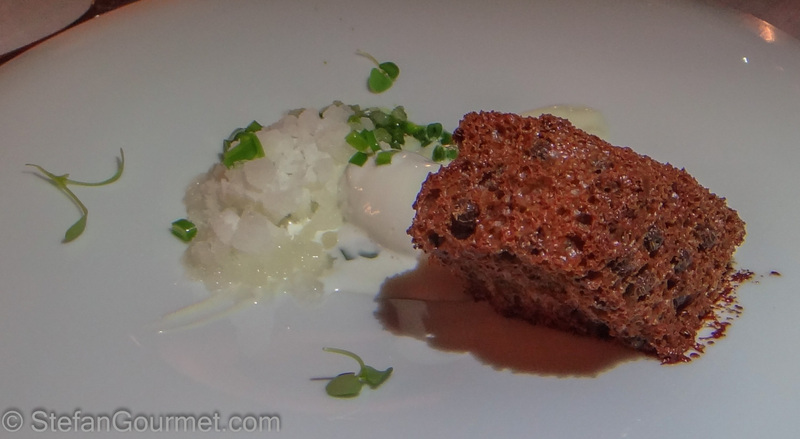 The spring onion mousse wasn’t interesting by itself, but it did support the flavor of the rest. The combination of the crispy caramel on top with the smoked eel, foie gras, and crispy fresh apple worked very well (10/10). This cooked oyster with cucumber, kaffir lime and coconut was a very nice palate cleanser with the oyster very tender (9/10). 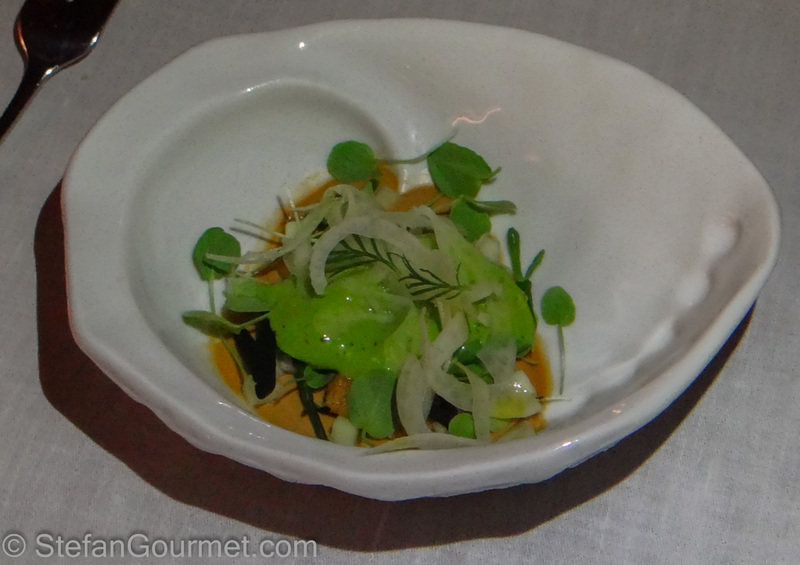 Raw seaweed and seaweed cream on sea urchin curd with fennel salad (2014). 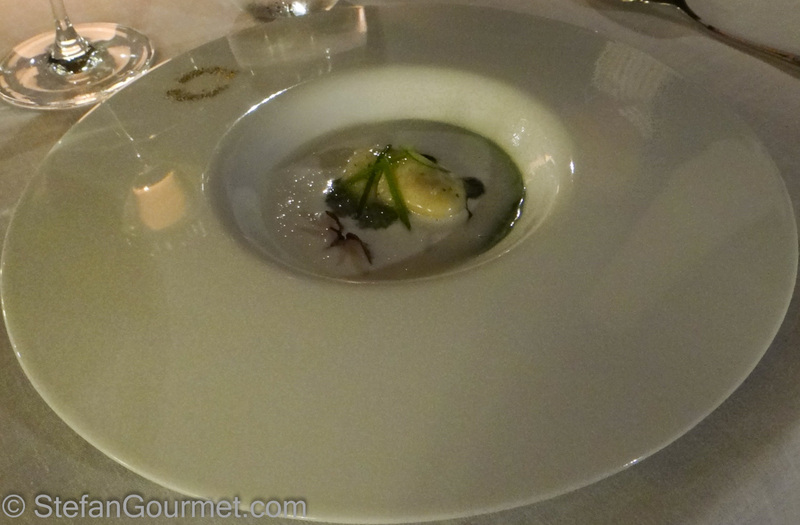 Another very good combination of flavors with a ‘bisque’ made of sea urchin at the bottom (9/10). 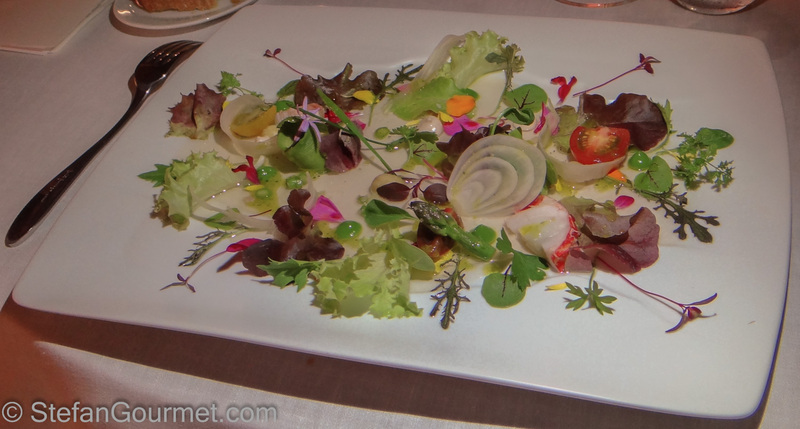 Another signature dish: vegetable hearts salad with seafood, cream of lettuce and iodized juice (2001). The seafood was lobster and the dish was as delicious as it looks (10/10). As we had not yet finished the bottle of red wine we had ordered with the pigeon, we asked whether it would be possible to get just a little bit of cheese. This is what was brought to our table: just the right amount, perfectly presented, and free of charge! 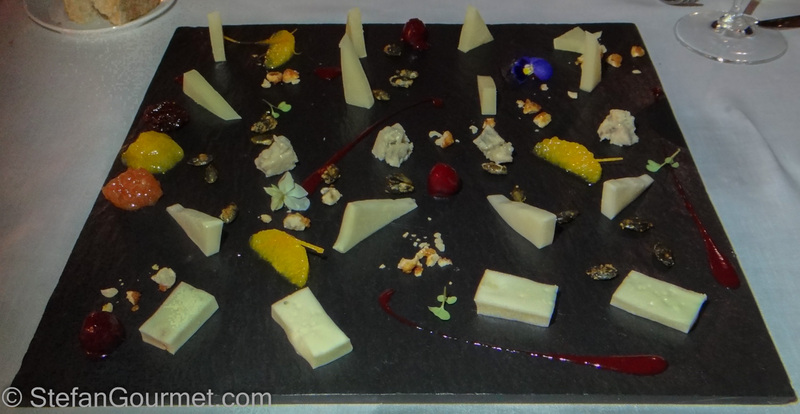 There were five bites of cheese for each of us, ranging from young and creamy via blue cheese to ripe manchego as well as some nice flavors to go along. The first dessert: gin tonic with mint over cucumber, lemon and apple popcorn (2014) was very nice (9/10). The second dessert, smoked sponge with cocoa crunch, frozen whisky cream, crushed ice, green beans and mint (2014) was great as well (9/10). The service was outstanding. The serving staff was very attentive to our every need and not a single mistake was made. The sommelier was very helpful in choosing the wines and didn’t just recommend the most expensive bottles. At the end the sommelier brought us the labels of the wines we had enjoyed with our dinner, which I thought was a very nice gesture. I already mentioned the additional cheese. 9.5/10 for the service. The only thing missing to turn this from a great dinner to one of the best ever was matching wines. The wines we had were good and in most cases they did not clash with the food, but with matching wines we surely would have had an even more wonderful experience. 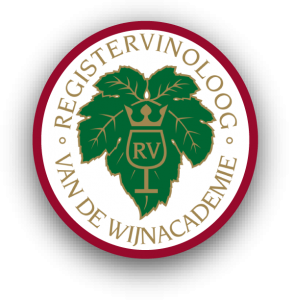 It would be quite a challenge for a sommelier to match wines with the complex flavor profiles of the chef’s dishes, but I believe it can be done with some perseverance (not to mention that I would volunteer to help). As fitting for a restaurant that has your own name, the chef was actually there and came around the tables to greet the guests. He had brought along one of the waiters as an interpreter, as he doesn’t speak English. He seemed shy for such a great chef, but perhaps that was because of the language barrier. I think the presence of the chef is important, not because I like meeting chefs but because in my experience it has a positive impact on the quality and consistency of the food. 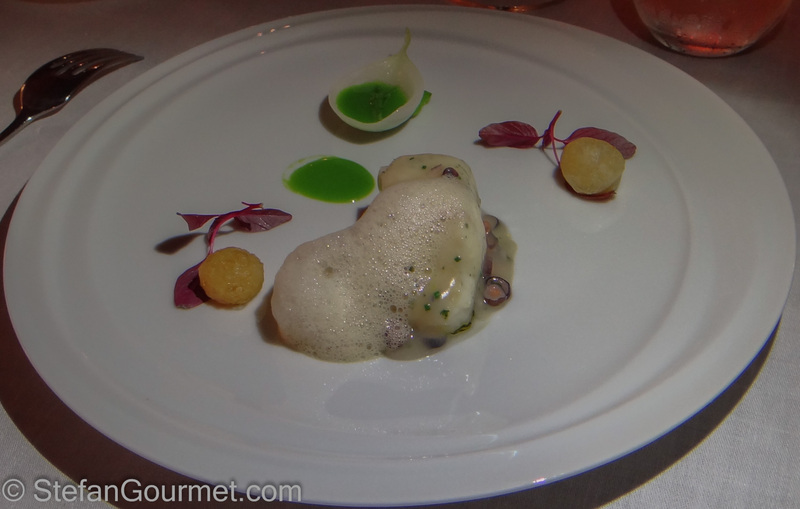 The food of Martín Berasategui is outstanding. 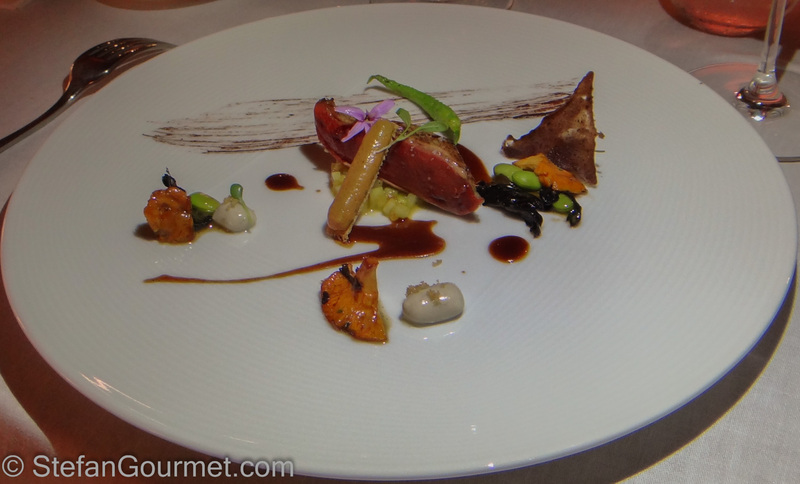 Not just every individual dish, with each and every dish at a very high level, but also the build-up 0f the menu. 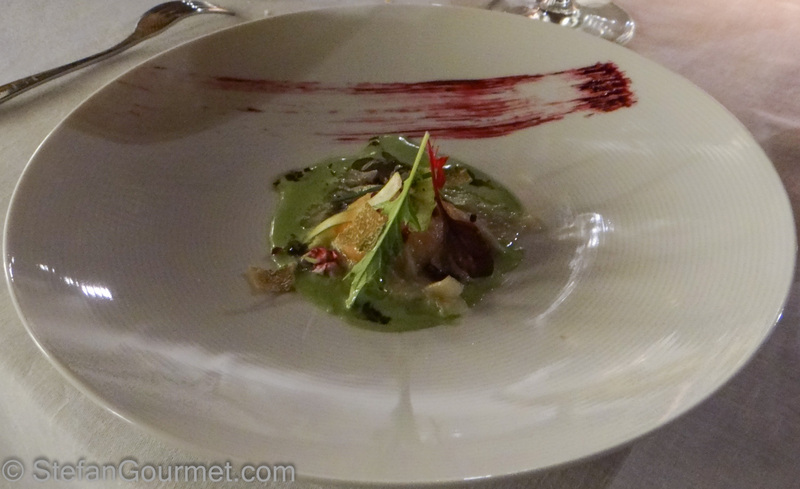 I like that most of the dishes were new, but there were some signature dishes included as well. The food looks gorgeous, but most importantly everything is delicious, refined, and imaginative. Dishes are big enough so that you don’t finish them in a single bite, but the amount of food is just right as well. Technique is clearly used to create better flavors and textures, not just as a gimmick. 9.9/10 for the food.